When it comes to winning the Premier League title of the current season, Chelsea are the favorites as Antonio Conte has led his team to the top of the English League with 56 points secured from the 23 opening league matches that they have played so far. Tottenham Hotspur is sitting in 2nd place with 47 points, Arsenal in 3rd also with 47 points, Liverpool in 4th place with 46 points, Manchester City also has 46 points and Manchester United is slightly behind the rest of the table-toppers with 42 points. Eden Hazard believes that despite Manchester United falling behind in the English Premier League standings, they are one of the main teams that Chelsea should be worried about along with Arsenal. The second half of the campaign has been excellent for Chelsea, according to interim manager Guus Hiddink. He replaced Jose Mourinho midway through the campaign. At the time of his arrival, there was even a possibility of relegation battle for Chelsea. 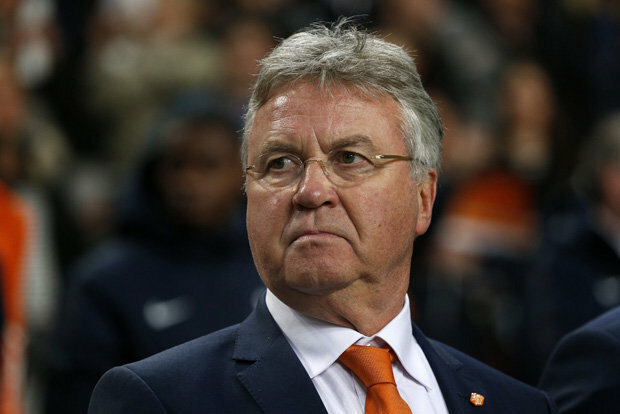 Such was the incredible fall from grace for the 2015-16 champions that Hiddink was largely expected to not make much of an impact in terms of league position. This has been true to a certain extent, as Chelsea have been only able to make it back into the top 10 of the table. Chelsea midfielder Frank Lampard is delighted that the club are back in the title race this season, and is relishing the end of season run-in, according to Sky Sports. The club were fourteen points adrift of champions Manchester United last season, while they were twenty-five short of Manchester City’s winning tally of eighty-nine points in the 2011-12 campaign. However, with eight games left to play, they are in pole position, four points ahead of both Arsenal and Liverpool and six in front of Manchester City, and despite those sides having games in hand over the Blues, Lampard is up for the fight. Meanwhile, Didier Drogba believes that his former club are on course for success, and that Jose Mourinho can build “another great team” at Stamford Bridge, the Daily Star understands. The Ivory Coast international, who returned to his former stomping ground on Tuesday evening as his Galatasaray side crashed out of the Champions League, has been strongly linked with a return to Chelsea in some capacity in the future. Elsewhere, the club have been linked with a move for Southampton striker Sam Gallagher, according to the Metro. The teenage, who is the latest in a long line of young talents to break into the Saints’ first team, scored his first Premier League goal in a 4-2 win over Norwich City last weekend. Chelsea are expected to include both Ramires and Willian in their starting line-up for this evening’s Champions League last sixteen second leg against Galatasaray, with both midfielder suspended for Saturday’s clash with Arsenal. Ashley Cole is doubtful having been absent from training on Monday, though David Luiz is fit and could replace the cup-tied Nemanja Matic, while Mohammed Salah is also ineligible having represented Basel earlier in the competition. Former Blues forward Didier Drogba is expected to start for the visitors, with the tie finely poised following the 1-1 draw in the first leg in Istanbul three weeks ago. Meanwhile, Jose Mourinho is confident that the Ivory Coast international will return to the club in some capacity in the future, according to the Metro. This evening will see Drogba return to Stamford Bridge for the first time since leaving the club following their triumph in the final of this competition in May 2012. The forward, who was taken to London from Marseille by Mourinho in 2004, scored 157 goals in 341 appearances, plus the winning penalty in the shoot-out victory against Bayern Munich at the Allianz Arena. The Blues boss believes that the 36 year old will return at some point as either ‘a player, coach or ambassador’. Chelsea’s hopes of winning a first league title in four years were dealt a blow at the weekend as they lost 1-0 at Aston Villa. Fabian Delph’s back-heel eight minutes from time was enough to secure all three points for Paul Lambert’s side, who moved into the top half of the table. However, the Blues’ lead at the top has been cut to four points, with second place Liverpool and third place Arsenal winning at Manchester United and Tottenham Hotspur respectively, whilst fourth place Manchester City, who also took all three points from their game at Hull City, are a further two behind. All three of the chasing pack have games in hand over Chelsea; one in the case of Liverpool and Arsenal and three for Manuel Pellegrini’s men who have been reinstalled as favourites by the bookmakers. The Blues will now turn their attention to tomorrow evening’s Champions League last sixteen second leg with Galatasary, before returning to league action against Arsenal on Saturday lunchtime. Lose to the Gunners, they could fall to as low as fourth by the time of thier game at Crystal Palace the following weekend, with the other sides in the Champions League places all playing in midweek. Roma are considering moving for former Chelsea striker Didier Drogba when his contract expires at the end of the season, the Mirror understands. The Ivory Coast international has been with Galatasaray since last January, scoring twenty goals in fifty appearances in all competitions, but is set to move on in the summer. Drogba has previously spoke of his desire to one day return to Stamford Bridge, though the Serie A side, who are set to return to the Champions League after a three year absence next season, are reportedly set to offer the 36 year old a lucrative one-year deal. Meanwhile, Zenit St Petersburg have given Brazilian striker Hulk the green light to move to the Premier League next season, according to the Express. Jose Mourinho, who is almost certain to be in the market for a new striker in the summer, is a long-time admirer of the 27 year old, who has scored nine goals in fifteen league outings for the Russian champions so far this season. Tottenham Hotspur have also been lined with a move for the former Porto man, with a price of £40m set to be enough to secure his services in the summer. Chelsea’s Champions League last sixteen tie with Galatasaray is finely poised as the two sides played out a 1-1 draw at the Turk Telekom Arena yesterday evening. Fernando Torres gave the Blues the lead after just nine minutes with an early tap-in only for Aurelien Chedjou to draw the hosts’ level from close range after being left unmarked almost twenty minutes into the second half. Jose Mourinho’s men remain favourites to qualify for the last eight having, unlike their three Premier League counterparts in the competition, avoided defeat, with the second leg scheduled to take place at Stamford Bridge two weeks on Tuesday. The club will first turn their attention to Saturday afternoon’s short trip to Fulham, where they will hope to strengthen their grip on first place in the Premier League. Meanwhile, Chelsea strikers Demba Ba and Samuel Eto’o have insisted that they are not worried about recent comments made by Jose Mourinho which suggested that he is not happy with his current front line, according to Sky Sports. The Blues boss has also branded the reporter who leaked what was said ‘a disgrace’, when asked about it at a press conference following last night’s game.